Scientists in Silicon Valley and Germany have kicked off a five-year project to create a particle accelerator that's the size of a shoebox -- a project that, if successful, could revolutionize scientific and medical research. Particle accelerators have been an important tool for fundamental physics research for decades, but they are costly, complex and long. Their job is to accelerate charged particles to high energy levels and the higher the energy required, the longer the accelerator needs to be. The accelerator at the SLAC National Accelerator Center in Menlo Park, California, is about three kilometers and the Large Hadron Collider at CERN, used to discover the Higgs Boson particle, is a 27-kilometer loop. So on the face of it, shrinking this kind of machine into a shoebox appears impossible. But work done in 2013 by two independent teams, one at Stanford University and SLAC and one at the Friedrich-Alexander University in Erlangen, Germany, revealed the ability to speed up charged particles using laser light and a specially etched glass channel. The researchers built silica glass chips with tiny microscopic tunnels that had ridges along their walls. 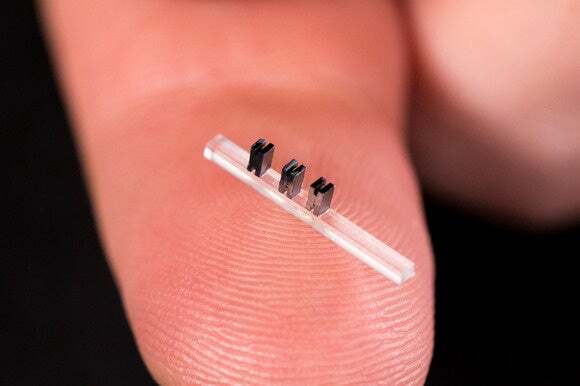 When laser light was shone onto the chip, it interacted with the ridges to produce an electrical field that could dramatically boost the energy level of particles that were being sent through it. 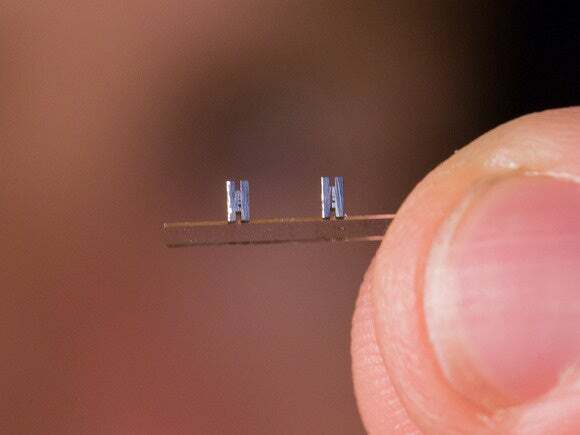 Two “accelerators on a chip” made of silicon are mounted on a clear base. In their 2013 experiments, they found the energy boost was 10 times better than that of SLAC's accelerator over the same distance but researchers think they can take that to 100 times, meaning much shorter accelerators can be realized. "It's a revolutionary approach," said Joel England, a SLAC scientist who is working on the project. It's being funded with a $13.5 million grant from the Gordon and Betty Moore Foundation. He said the group hopes to realize a device that can produce particles with an energy of a few million electron volts (meV). That's enough for scientists to produce so-called molecular movies, which capture physical or biological actions that occur in a femtosecond -- one quadrillionth of a second. 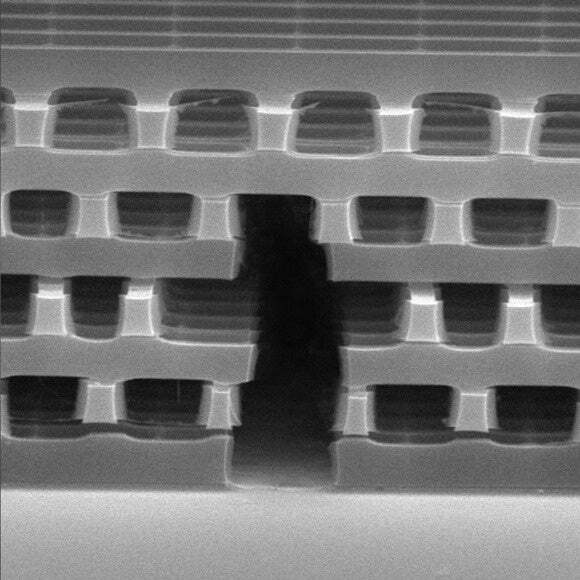 This image from an electron microscope shows one of the accelerator-on-a-chip designs being explored by the international collaboration. The five-year project will work on all the components needed to produce a shoebox-size device and hopes to come up with a working prototype.